The Space Store and ESProduction formed an alliance last year to produce and sell the most authentic NASA reproduction spacesuits in the world in their respective price ranges. 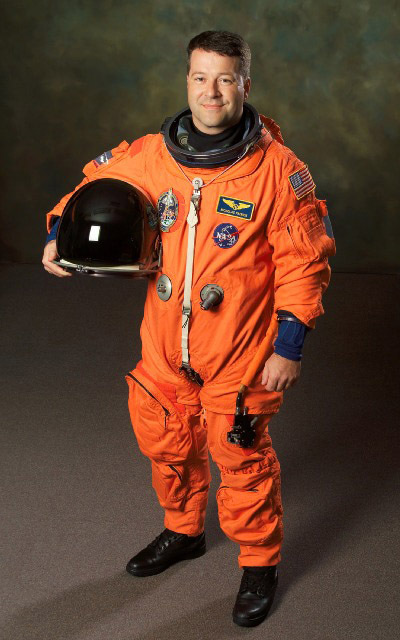 The two suits being produced include the orange space shuttle launch and entry suit (Advanced Crew Escape Suit, or ACES) and an Apollo replica of the A7L suit worn by astronauts on the moon. A limited number of the space shuttle "pumpkin suits" are now available for order exclusively through The Space Store. Designed and produced by Eamonn and Sivorn Price of ESProduction, these suits will offer unsurpassed levels of quality in terms of authenticity and durability in their price range. Suit dimensions are 46 waist by 34 inseam. If a smaller size is needed the suit can be tailored locally; at this time smaller sizes will not be produced unless demand requires. A prototype of the Apollo suit is now in production, and a limited number are projected to be available by April 2011. The Apollo suit will include the spacesuit itself, boots, gloves, backpack, "Snoopy Cap" and helmet. Eamonn Price is currently the foreman and head of WonderWorks Inc. and has been for 14 years. WonderWorks is an award winning Special Effects company that has produced spacesuits and spacecraft, such as the space shuttle, Apollo capsule, lunar module and Mercury capsule, for dozens of films. His work can be seen at wonderworksweb.com. Sivorn Price graduated top of her class at Fashion Institute of Design and Merchandising (FIDM) in Los Angeles and has worked for movie and TV companies such as Universal Studios (on the "lot") for Desperate Housewives and many other shows producing all manner of wardrobe, wedding dresses and costumes for major films including the Sony films Spider-Man and Spider-Man 3. She also designed and created the cloth portions of the new generation spacesuits for WonderWorks. They are applying their design expertise to create these suits to be affordable by the collector using WW molds, patterns and designs. These suits are in limited production because their busy schedules do not allow for long production runs. The suits are copyrighted and may not be used for film, TV, advertising, media, or other "commercial use". These are intended for personal use and collection only. Similar suits can be rented from WonderWorks. The Space Store was founded in 1995 by radio personality and motivational speaker Dayna Steele, who is married to a former NASA pilot. The clicks-and-mortar store had a physical location across the street from NASA's Johnson Space Center. Current owner Brett Anderson bought the store in 2006. The Space Store now exists online only, with company headquarters located in Denver, Colorado. The Space Store carries the largest selection of NASA logo wear, space collectibles, flown-in-space artifacts and astronaut autographed items online. Maybe the chest pocket is for the "boarding passes"? Or to stow ascent checklists, once completed, for later autographing? 46" waist! Wow, I could get the wife in with me! It would take a lot of work to make that suit look half-way authentic. It would be better to start from scratch! I don't recall one either on ACES or LES, mainly because the survival vest goes in that area and it would likely have the pockets. A pocket covered by a vest can't exactly be accessed easily. Most of your pockets on a suit will be on the arms and legs, where they can be accessed. As the suit is, it looks a little closer an LES than an ACES since it doesn't have the wrist lock rings (LES had zippers to attach gloves). But I do see A LOT of details that were left off. $935 is a bit pricey. That's pretty sweet! I would buy one if I could. Why is this spacesuit so expensive; you've got to be a billionaire to afford it! For that much money it could have been more accurate. That chest pocket is way too wrong and there are several things missing like the locking wrist rings and the second valve in the mid section. I know that helmet doesn't come with the suit. It looks like a Russian high altitude helmet. You'd think that they would at least TRY and make it look authentic. We're not talking about small details that only a space aficionado would notice. Show a small child a picture of a real suit, then show the child a picture of that and ask what's different about it. You would still come up with a lengthy list of errors. US$935 and you don't even get a helmet, boots, or gloves? To say nothing of a suit that would need serious work to even come close to resembling an actual LES? I love the Space Store, and it takes a lot to make me post a negative impression of what's probably a earnest effort...but based on the pictures, that thing is just a joke. I'm waiting for the Apollo A7L suit. If it doesn't come with a helmet (remember, this suit will be about $2500 so I should hope it does! ), are they going to offer one as a option? I'm waiting on the Apollo A7L suit too, for the gloves. I hope they are good quality. As for the ACES suit, to me it doesn’t look the right colour either. Could be the photo, but I’m sure the real ACES suits are a darker shade of orange. That's the same suit that WonderWorks rents for $500 per week. They could have done a much better job at making it look authentic. They have higher-quality reproductions available for rent only, although even those aren't accurate, they just look less like halloween costumes.